In the third of a three part New Geography series on Pittsburgh for the G-20 summit, Aaron Renn assesses Pittsburgh’s value as a model region for other cities suffering decline. As the G-20 leaders prepare to convene in Pittsburgh, expect the recent chorus of praise for that city's transformation to reach a crescendo. Pittsburgh, once the poster child for industrial decline and devastation, is now the media darling as an exemplar of how to turn it around. The New York Times talks about how “Pittsburgh Thrives After Casting Steel Aside” while the New York Post informs us that “Summer in Pittsburgh Rocks”. The Economist named Pittsburgh America's most livable city. This emerging reputation for cracking the code on revitalization is prompting struggling burgs like Cleveland and Detroit to ask what lessons the Steel City holds for them. Population Is Shrinking. The city of Pittsburgh has lost over 50% of its population since its peak and it is still declining. Just since the 2000 census Pittsburgh has lost nearly 25,000 people – over 7% of its population. The metro area is shrinking too, making Pittsburgh one of only a handful of large metro areas with the dubious distinction of population decline. Others on that list: Buffalo, Cleveland, Detroit, and New Orleans. Since 2000, metro Pittsburgh has actually lost a greater percentage of its population than metro Detroit. International Immigrants Are Staying Away. Metro Pittsburgh's foreign born population percentage was 2.6% in 2000 – very low. The Pittsburgh Technology Council summed it up best when it said, “Our region has negligibly grown its foreign born population.” Contrast Pittsburgh with the national average for foreign born population of 5.7%, and regions like Boston (11.2%), Denver (9.3%), and even Detroit (6.1%). Poverty Is High. Pittsburgh's economic area poverty rate is worse than all cities benchmarked against it by Pittsburgh Today at 11.6% versus 9.3% in Milwaukee, 9.9% in Cincinnati, and 10.5% in Cleveland among 14 comparison cities. Still, by other measures Pittsburgh is, if not thriving, certainly outperforming both the Rust Belt and the nation as a whole. Its July metro unemployment rate of 7.8% is well below the national average. In the last 12 months, Pittsburgh lost 2.8% of its jobs, which is a much better performance than regions like Chicago (-4.5%), Atlanta (-4.9%), and Portland (-5.8%). Its housing market, having never boomed to begin with, has not experienced the declines of most of the rest of the country, making it a Rust Belt outpost of the “zone of sanity”. Pittsburgh has a large “eds and meds” sector, led by the University of Pittsburgh, whose medical center employs over 25,000 people, and Carnegie-Mellon University. Pittsburgh was early to the game in this approach, with steel fortunes powering the development of these institutions starting in the 1950s. There are now seven universities within a five mile radius of downtown. Eds and meds employment is quasi-public sector. It can be a source of stability, but it's not proved to be the source of dynamism that you see in Silicon Valley, around Boston or even Madison. Sure, there have been some high tech successes in Pittsburgh, but the city is far from a hub of the innovation economy. Pittsburgh's downtown remains an employment center with a density uncommon in a Rust Belt full of cores defined more by parking lots than vital streetscapes. Pittsburgh has long had a rich fabric of dense, urban neighborhoods, and many of those are strengthening. The city's geography retains its charm, and a lot of former industrial areas along the three rivers have been repurposed for recreational use. The truth is that the Pittsburgh story is still being written. It’s still more “green shoots” than a true renaissance so far. Until its migration statistics change course, and it demonstrates sustained and growing economic dynamism, the city cannot claim to have truly turned itself around. Still, the signs of progress are better than in places like Cleveland and Detroit. Passion for the City. Older river cities like Cincinnati and New Orleans tend to have strong provincial cultures, with all the good and bad that implies. You see this in Pittsburgh in the unique local “yinzer” dialect, traditions like the cookie table at weddings, and of course the Steeler Nation. There's a strong attachment to the native soil in Pittsburgh, even for those who left. Starting Early Into the Cycle. Jane Jacobs pegged Pittsburgh's economic stagnation to 1910. The steel industry collapsed decades ago. Pittsburgh had troubles before other cities, so it is figuring out how to deal with them before other cities. It takes a long time to recover from a hundred years of status quo thinking. Shrinkage. There's no longer a need for a Fort Pitt to project military power. The steel industry is gone and with it the need for thousands of steelworkers. Part of the issue in the Rust Belt is that there is no longer any economic raison d'etre for some of these big cities. Pittsburgh long was too big for its role in today's economy, so shrinkage was good. This also created the rather unique institution of the Pittsburgh diaspora, best known through the Steeler Nation. Like the Indian and Chinese diasporas, it's a network of people who went out, made connections in the world, built new skills, etc. 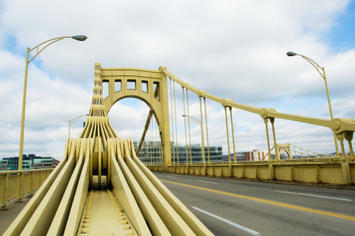 that Pittsburgh can now tap into, as tirelessly documented by Jim Russell. The Totality of the Collapse. On Wall Street they call it “capitulation”, where the markets hit bottom and there is no positive sentiment. You have to hit that bottom to start back up. Pittsburgh went through a civic devastation when the steel industry collapsed the likes of which few American cities have seen. This shock to the system created the conditions necessary for change that a more gradual decline would not have. Dramatic Educational Improvements. The Chicago Fed reported that Pittsburgh's national rank for percentage of adults who were high school grads went from 55th to 3rd. And for college grads it went from 69 to 37. These are amazing numbers. Is the Pittsburgh model transplantable elsewhere in the Rust Belt? In the short term, no. Pittsburgh's successes of today are rooted in 30 years of steel industry collapse, shrinkage, and boosting its brain power. The auto industry restructuring eventually might bring a needed jolt to Detroit and other Rust Belt cities, but recovery is a long term game that requires sustained commitment over many years to things like education. Pittsburgh has achieved some of this, perhaps not as spectacularly as the media suggests, but in ways that are still useful for other Rust Belt cities to ponder.